All but the very sceptical now accept that our climate is changing and serious action is needed to slow down the damage caused to our environment. 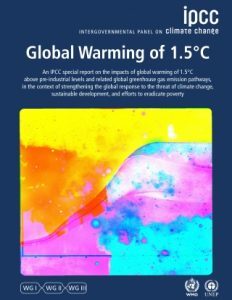 The recent report by the UN international Panel on Climate Change (IPCC) has said that we have about 12 years to ensure that we don’t exceed the 1.5 degree increase in global warming and has outlined some of the serious consequences of missing the target – even by only half a degree Celsius. At the time of its publication, there was much media coverage, which is great in raising awareness of this important subject, but there doesn’t seem to have been any significant business response. As individuals, we all have a role to play in reducing energy use and thus global warming, but small changes by big businesses by definition have the potential to make a disproportionately large impact. In the last few weeks, two examples of business practices which seem to take no recognition of the importance of climate change have stood out to me. In no way am I criticising the businesses behind these practices, it’s a competitive world out there, but they do highlight how big a sea change is needed in business thinking if we are ever going to reduce our dependence on carbon and perhaps save the environment. First example. Recently, my friend’s car had to go to the garage due to a damaged AdBlue tank – yes, it’s diesel, that’s a whole different blog – but not only did the new tank have to come from mainland Europe the car had to be shipped from Wrexham to the North East of England to a specialist repairer. All of which was anything but zero carbon. Today, businesses are becoming so complex and specialised that they build in even more carbon to their business operations. Second example. Recently, we had to have a small wall rebuilt after an insurance claim. True, many of the bricks could be salvaged and were therefore reused, but the insurance company has a contract for such works with a building contractor. The work took two days and the builder drove 50 miles each way to undertake the work. Why wouldn’t the insurance company contract the work to a local builder, which would reduce traffic as well as reducing carbon emissions? As I mentioned earlier, these examples are not unique to the businesses concerned and on their own don’t amount to much, but when you consider the imperative businesses have to grow and how many businesses will be doing something similar every day across the globe, the only conclusion I can come to is that businesses need a real shake up in how they operate. To date, there’s little evidence that many are about to do so. This entry was posted in Blog, Environment, Ethos public relations and tagged climate change on November 23, 2018 by Sean. More needs to be done to develop renewable technologies such as wind energy. News that the Government is stepping up its campaign to promote fracking through financial incentives to local authorities and communities has reignited the debate about this controversial energy source. However, in my opinion, supporters of fracking will have an uphill struggle to persuade the public. From a PR point of view, it all starts with the name. Has there ever been a more apocalyptic sounding source of energy?! Even if it was the most benign process ever, it would still ring alarm bells to me. The thought of doing “fracking” or “hydraulic fracturing” to anything makes me think that some serious damage must be being done somewhere. The second thing is that it is likely to take place mainly in the countryside, often on the edge of villages or towns. Recent research shows that the overwhelming majority of people don’t want fracking on their doorstep, and we’ve already seen significant demonstrations where fracking is proposed, which are only likely to get worse. In addition, evidence demonstrates that fracking causes earth tremors and may also lead to water contamination and pollution. Until we know more, I think most people would be pretty alarmed to think that fracking could lead to problems like these where they and their families live. In fact, as fracking has been banned in France, surely the process itself should be a cause for concern in this country too? These days, most people accept that human-made climate change is taking place, so it is puzzling why the Government is looking to subsidise new and controversial fossil fuels which contribute to carbon emissions. It’s a shame that, despite all the warning signs, they are still thinking more about short term profit than protecting the environment for future generations. There is no guarantee that fracking will bring down energy bills and, given the set up of the energy market, I should think lower bills are highly unlikely. Besides, is cheaper energy from fossil sources something we should be aiming for? Of course the obvious question after all this is, if not fracking then what? A head-in-the-sand energy policy in this country for many years has left us desperate for new energy sources. However, I still think much more needs to be done to develop renewable, carbon-neutral technologies, rather than new fossil fuels, and I for one would much prefer a wind turbine at the bottom of my street than a fracking rig! This entry was posted in Blog and tagged climate change, fracking, renewable energy, wind energy on January 20, 2014 by Shaun.